Roj Dae-pa-Meher Mah Adar, 1382 Yz. These prophetic words of immortal Firdausi were put in the ears of the mythical Simorgh bird, as it carries away the Albino child Zaal-e-Zar from an abandoned cliff. According to the Shah Nameh, the Pahelwan family of Saam was known worldwide for its bravery and loyalty to the Kings of Iran. Saam was the grandson of the bravest warrior of all – Keresasp, and the son of the valiant Nariman. Those were the early days of history, when the world was split into two camps – the Mazdayasnis – the followers of Truth and Ahura Mazda, and the Daevayasnis – the followers of deceit and falsehood. While the Mazdayasnis had the power of the sacred Manthras and the protection of the White Side of Nature, the Daevayasnis were great adept in the material sciences. Their speciality was in the transmutation of elements. In a second, they could transform a lush forest into a desert, or a valley into the sea. The normal population would be greatly influenced by these feats of science and engineering and would gravitate towards the Daevayasni Lords. At this time, the valiant warriors of Keresasp’ s family kept things in control with their won powerful Nirangs and Manthras. To handle these powerful Daevayasni warriors was not easy. In those days, the Daevayasni forces were led by a multi-faceted entity called Sohaam, who could change his form and shape in a second. Sohaam reigned terror throughout the world and became the champion of the Dark Forces. Using his sacred Manthras and Nirangs, Saam succeeded in capturing Sohaam and proceeded to kill him. Sohaam begged for his life and in return promised Saam that he would take the form of a horse which Saam could ride and expose the black forces of Nature. Riding such a terrible creature was not mean feat, but Saam was more than a match for Sohaam. Over the next many years, Saam rode Sohaam throughout the corners of the world, using his knowledge to deal fatal blows to the Daevayasni forces. For this reason, Saam was given the epithet – Saam-e-Savaar – The Rider Saam. Now it so happened that a baby boy was born to Saam. But according to the Shah Nameh, the boy was completely white and covered with white hair, hence he was named ‘Zaal-e-Zar’ ‘White haired.’ When Saam saw this son, he thought him to be an evil offspring and ordered that the baby be thrown away in a desolate valley. As the child was abandoned, the mythical bird Simorgh saw the baby crying in the desert and picked him up to feed his chicks. But as the Simorgh carried him away, a Divine Voice told Simorgh that this baby was destined to be the father of the greatest warrior the world was to every see. Hence he should forget about eating the child and instead nourish him and raise him up as his own offspring. Thus over the years, Simorgh raised Zaal to a fine strapping boy. 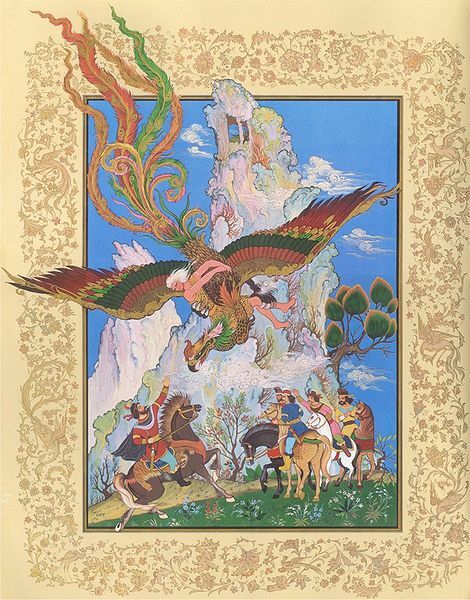 Many years later, Saam sees his son in a dream and goes to retrieve him from the Simorgh. After some problems, Saam and Zaal are re-united. What is the meaning behind this story? How can a bird raise a human boy? Who was Simorgh? Was He a bird? Why was Zaal born with white hair? What great truths did our Master, Ustad Saheb Behramshah Nowroji Shroff reveal about this episode of the Shah Nameh? These wonderful details are explained in this episode of the series of the Rostam Nameh. Please click the link below to download the third part of the talk. Your post dated 21 April regarding revered Sarosh Yazad and how a Parsi family was saved is still incomplete. I am looking forward to the remainder of this post. Also, the above post is part 3. Where can I find parts 1 & 2? Looking forward to your revert. If you see on the right hand side of the page there is a whole list of Categories. In that Category list there is an entry for Rostam Nameh, as well as for Iranian History. You will find these and many more articles there. Please explore the site and you will find over 170 articles in different categories. I mix and match articles so that readers do not get bored of the same story. I will complete the story you have mentioned. Please have patience. In the mean time read up all the articles you have missed in the past four years. Thanks a ton Respected Ervad Marzban Saheb for your super quick response. I was really eager to see the concuding part of the post. The post was really riveting. Anyway,will wait patiently for the same.